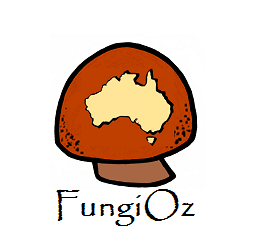 The Australia pagoda fungus, Podoserpula Pusio is a unique multi-tiered mushroom that grows on well-rotted wood. I have only ever found it buried deep in moss with the stem arising from buried wood. It comprises a series of pale pink-apricot lobed tiers with wavy to frilled margins, that surround a thin central stem. The lobes become progressively smaller towards the stem top. The upper side of the lobes is soft, pliable, dry and somewhat furry or suede-like. The lobes have a diameter to 25 mm, are irregular kidney to oval-shaped and become somewhat funnel-shaped when mature. 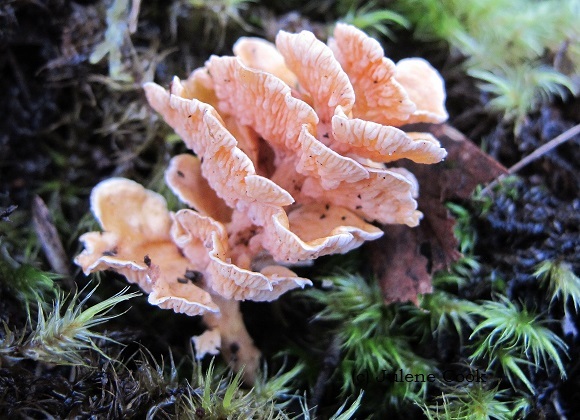 The Stem is thin, pale pink and reaches deep into moss beds towards rotted wood below. Picture of Podoserpula pusio's spore bearing crinkles. In place of gills the underside spore-bearing surface has decurrent, contorted crinkles with raised surfaces and nodules. 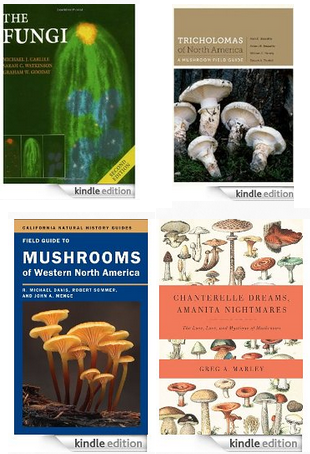 The spore-print is white. Cap: To 30mm, convex as a button, bright yellow/orange, waxy and pitted like orange peel, becoming flat then upturned into a funnel with crinkled margins. 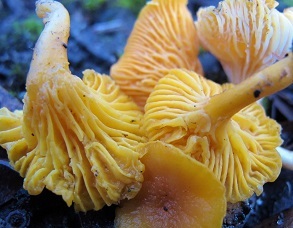 Gills: Folds rather than gills run down stem and they are the same as cap or lighter. 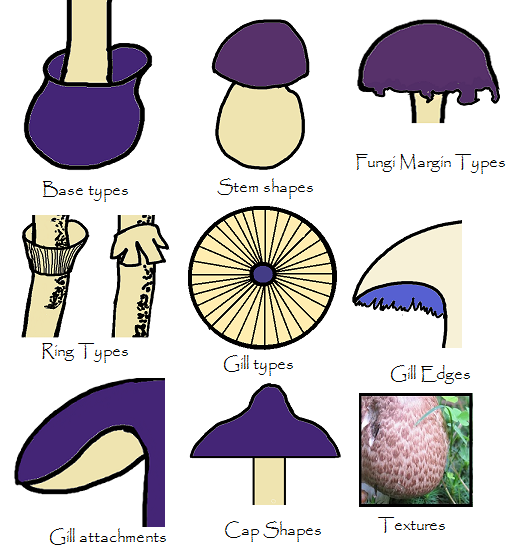 Stem: Tapering down, waxy, same colour as cap with lighter base. Found: In small to large clusters on the ground beside path in eucalyptus tea-tree woodland. 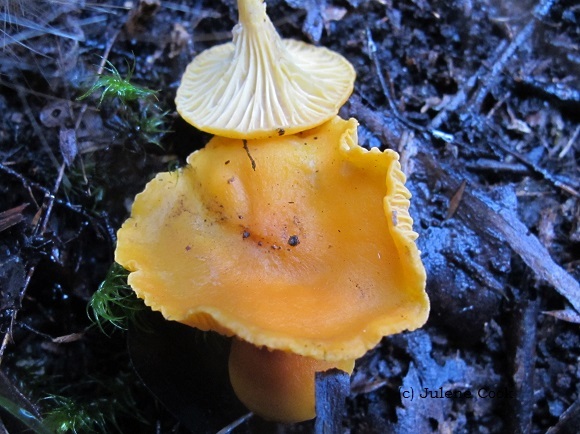 The cap of Cantherellus concinnus is up to 30mm, and is grey-brown. It opens out from a hollow centre that is extension of the hollow brown stem. It is rather crinkled on top as well as the underside. 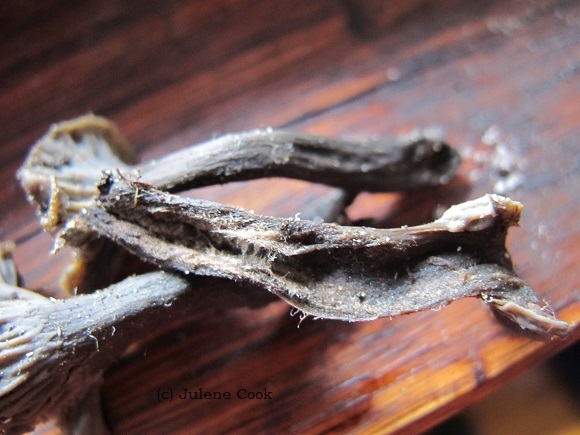 Underside: Crinkles that run down the stem. Found: Scattered on narrow peppermint gum woodland floor in mid-winter. 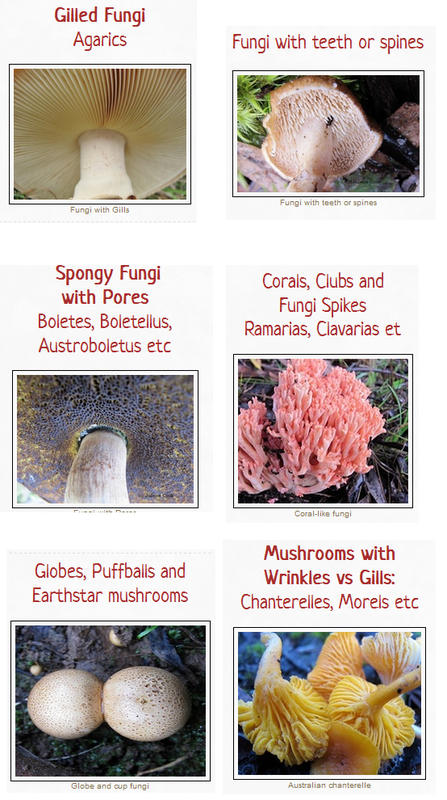 The Rogers mushrooms website at the link below describes this as rare, at least in the U.S.